While indoor cat owners are used to the fact that their cats may leave smelly and messy litter boxes, today’s market is full of designed furniture, making the whole endeavor of taking care of your cat’s waste a lot easier. From self-cleaning litter boxes to designer cat box furniture made to blend directly into your home decor, pet owners can now enjoy living with their cats more than ever. Here is a list of ten litter box covers that give the appearance of tasteful furniture. This litter box cover has a classic design that easily blends with any interior décor. The first thing to notice about it, is its magnetic door that shuts and opens tightly. This will keep all mess and unwanted odors inside, but allow easy opening for cleaning. The inner part is very elegantly designed. It is suitable for all cats and even small dogs. Putting this cover together is very easy as it comes with clear assembly instructions and shouldn’t take more than 10 minutes work. 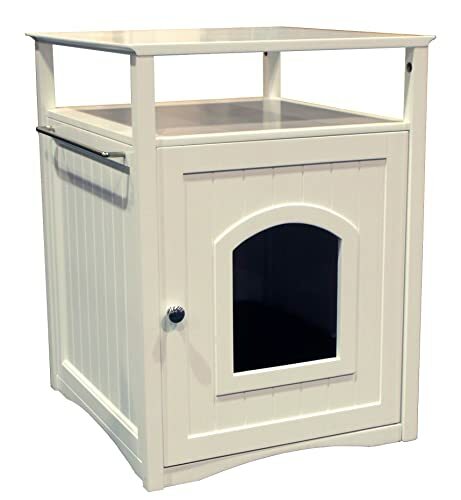 Multi-functional pet house or hidden litter box furniture. Lower price than most other concealed litter boxes. Attractive and stylish design that will fit into many kinds of homes. Cheaper materials make it more flimsy than other models of cat litter box enclosures. Box may be too small for some cats, which can cause “accidents,” such as waste getting outside of the pan. 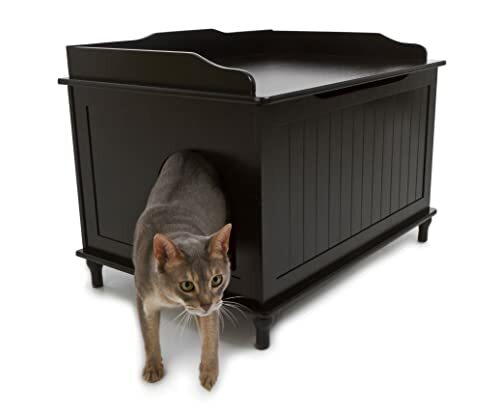 This litter box is nicely and perfectly rounded, discreet and blends in well with most interior décor. The lid is very easy to remove allowing cleaning as well as easy entry and exit for your cat. Litter box will remain well hidden from guests and family members. It is made of durable polypropylene that makes it last longer. Another great feature is the nicely vented system that helps control dust and odor from spreading. Designed for large cats and multi-cat households. Functionality could be an issue as day-to-day scooping can be challenging. This designer catbox has been primarily designed to keep your litter box concealed while granting easy access for your cat. 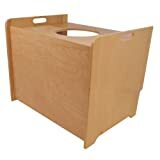 It is rectangular in shape, made from high quality wood and painted with safe lead-free paint. 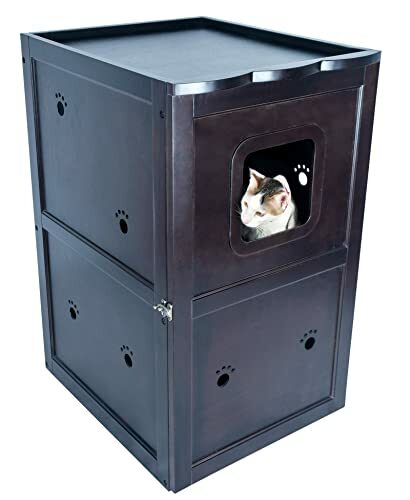 Due to its large size, it also has storage space for litter accessories such as a litter pan and litter scoop, which are well hidden from guests and other family members. The cat entrance openings are large enough to accommodate large cats. The Designer Catbox can be easily assembled, as it comes with clear and precise instructions for setup. An interior panel prevents litter from being kicked outside and onto the floor, while keeping litter box away from line of sight. Has a sleek design that will look good and blend into many different kinds of settings. Good at controlling odor as well as prevents dogs and curious small children from getting close to the litter and mess. May require a little DIY caulking to block possible litter leakage. Some cats will have to crouch too much to comfortably use it. The cat washroom bench helps keep litter and all mess inside the cover. Its large space allows for great functionality. 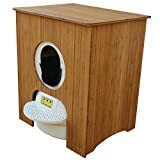 Due to its large size, it can efficiently cover any size of litter box, including extra-large ones. It also has magnetic doors that can easily be opened to allow cleaning. The inside is well decorated with a removable partition that provides additional storage space. The entrance is versatile and allows entry and exit holes to be placed on either side of the bench. This means that it can be conveniently placed in any part of the room. Removable partition wall creates a space to store fresh litter, scoop and other supplies. You can choose to not use the divider so your cat will have more space to move around. Putting it together is as easy as an can get. Porous floor of the box can absorb moisture, which is not good for cats who have accidents or are still training to use the box. Workmanship could be better–some holes may require you to redrill them so the screws fit properly. When you move it around, be careful. Floor board is a bit flimsy. The best thing about this concealer cabinet is what it is made of – eco-friendly bamboo-ply. It is very easy to assemble, taking less than 10 minutes. This cover is very easy to maintain as it has no back or bottom and can be easily moved from the litter-robot. It is pretty, sturdy and hides the litter robot nicely. Made of eco-friendly bamboo plywood. Great for the environmentalists out there! Lightweight screen which conceals the litter robot itself with no back or bottom, so it’s easy to slide off for cleaning. Sturdy enough to be used as a side table, so it blends into its surroundings well. Not compatible with all litter box types and litter robots. 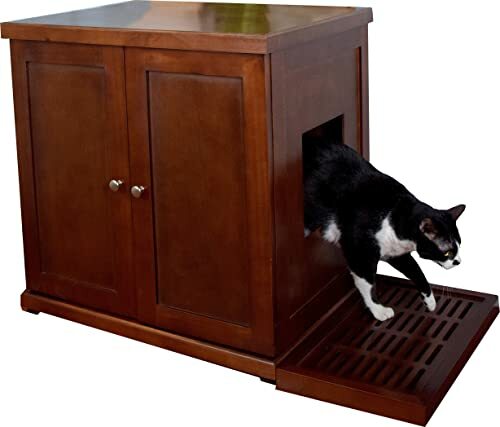 This top entry litter box has a modern touch, with beautiful and high quality light birch wood that has an excellent finish. It can be efficiently and easily be assembled for top entry or side entry by simply switching the front and top panels. The top entry is better in containing your feline’s mess, as it reduces litter spilling when your cat jumps out. Cleaning the box has also been made easy by a simple lightweight cover that can be easily lifted up to allow cleaning. Top or front entry into the box is possible. Simply switch panels with the entrance according to your and your cat’s preferences. Comes unfinished and ready to customize. This means that it is essentially a DIY hidden litter box cover that comes ready to paint or varnish in whatever way you choose to easily match your home’s decor. Lightweight design that fits snugly against the wall with cutouts to allow for base molding. High walls gives your cat the privacy that comes with this cover, while the litter box itself stays out of sight. This cover easily blends into the surroundings of the environment. Lower quality wood makes it less sturdy. Some may not appreciate the unfinished DIY style of wood and prefer a more finished looking product. The Petsfit Espresso Double Decker is large, sturdy and of good quality. 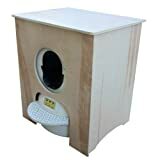 It serves as a multi-functional night stand furniture that can be used both as a pet house and a litter box enclosure. It is extremely easy to assemble and can house a number of cats at a time. The entrance has a latch holding the door, reducing odors and littering on the floor significantly. No more about litter tracking! The beautiful classic espresso design gives it an appealing look that easily blends with the interior design of your house. Multi-functional night stand that can be used as a pet house or a litter box enclosure. Latched door makes for easy cleaning. Effectively contains odors within enclosure. If you have messier cats who like to dig, this cover can make clean up difficult and unpleasant. Not as easy to assemble as other litter box covers. Not recommended for larger cats. 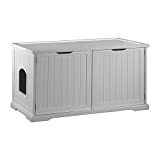 The Refined Feline litter box is pleasant to look at, as it easily blends with the entire house décor once placed at a strategic point. It is made of beautiful wood and contains a cat litter box cabinet that is very useful. 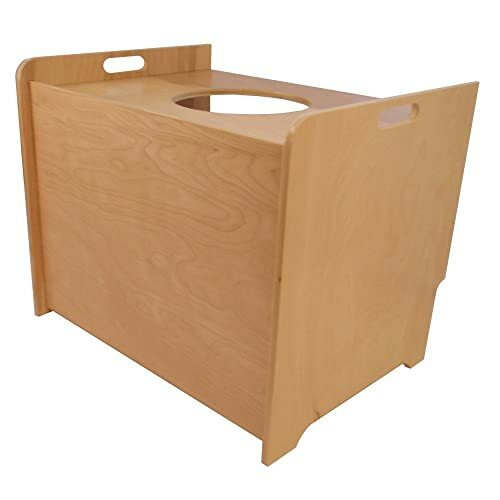 It has a top storage drawer that can be used to store extra items such as a litter scoop. The entrance can be either on the left or right thanks to the reversible walls. Electric litter boxes such as Scoop Free can be adequately housed here. It is quite easy to assemble too. Comes with an Internal plastic litter liner with high walls that contains litter for easier clean up. Comes with a top storage drawer. Reversible walls allow for left or right entry, depending on your personal set-up. Well-designed, built with Sturdy materials. Does your cat like to dig? Litter can fly out of this one a little too easily! This concealer cabinet has been specially made to be self painted. As it is a highly customizable cabinet, it can be very pleasing to the eye and blends in it’s surroundings easily. Its build is sturdy, strong and surprisingly very light. The litter works concealer cabinet helps conceal all litter appliances appropriately, creating space above the cabinet where you can store a number of items. Its opening is a basic screen style cabinet with no bottom and back so it is very easy to slide off your litter robot. Easy to assemble, assuming you can put together a typical piece of self-assembled furniture. Sturdy yet lightweight at the same time. Does a very good job of nearly eliminating litter dust. Can block the sensor that allows your Litter Robot to cycle properly if it is not set up well. Does require a little Do-It-Yourself to customize and make it nice and polished. Can be a hassle for those who aren’t DIY heroes. 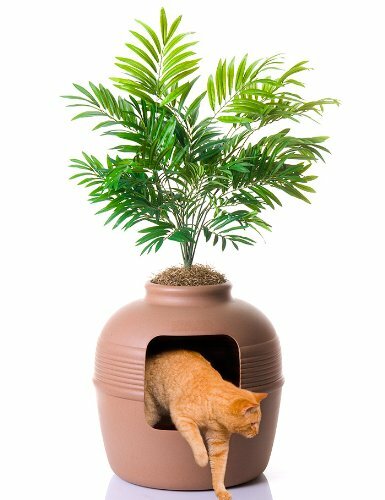 This model has been expertly designed for the convenience of your beloved cat. The opening is on the side, allowing discreet entry and exit for the cat. 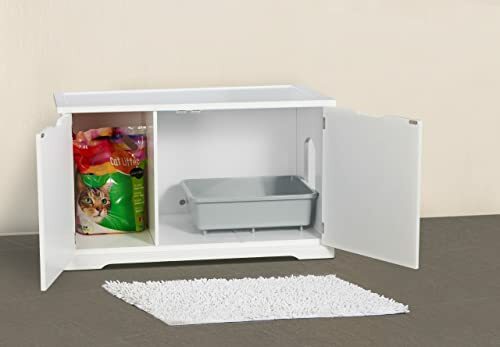 Litter boxes are perfectly concealed in a cabinet with magnetic door closure. This greatly helps to keep it’s surroundings clean and odor free as it locks the odor in. The sturdy magnetic doors that easily open and close firmly, allow easy cleaning and convenient removal of the litter boxes. Its size is versatile, fitting any cat and can easily fit in any standard room. 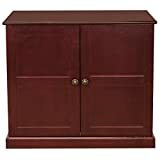 It has a mahogany finish that makes it both look great and much more durable. Very attractive and stylish designer cat box. 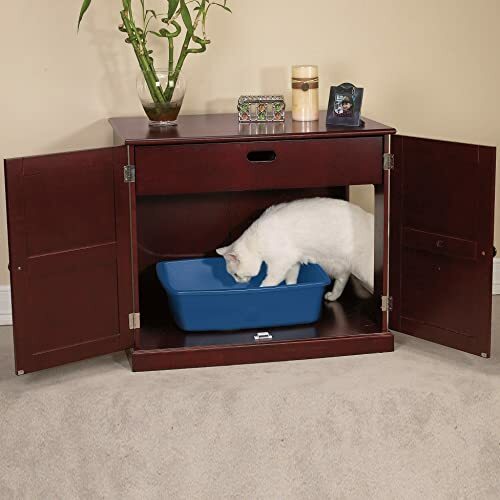 Equipped with magnetic-closing doors for convenient litter box removal and cleaning. Opens on the side, making access easy for your cat while it is still discreetly hidden. Comes equipped with a storage drawer. Very comfortable for storing pet supplies. Looks just like a real piece of furniture. Particle board can absorb smell if your cat has any accidents outside the litter box. Not roomy enough for all cats. Assembly instructions aren’t very clear.